Connie Paulette (Dailey) Harris, Apache, was born August 8, 1945 in Anadarko to Charles and Mary Dailey. She passed away peacefully on November 23, 2018 in Oklahoma City at the age of 73. Graveside funeral services will be held Monday, November 26, 2018, at 1:00pm at Fairview Cemetery officiated by Billy Harris. Arrangements are under the direction of Crews Funeral Home. 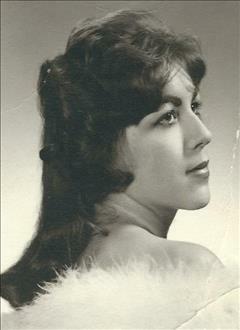 Connie attended and graduated from Broxton High School in 1963. She married Paul Harris on October 11, 1963, in Wellington, TX. They moved to Anadarko and she worked at Silvercrest Manor nursing home. They later moved to Apache where she resided until her death. Her husband preceded her in death in 2017. Connie was a nurse’s aide and homemaker. She enjoyed her family and grandchildren, always putting them before herself. She opened her door to everybody and never met a stranger. She is survived by her mother, Mary Dailey; children: Nena and Dennis DeForest of Apache, Bryan and Carol Harris of Mooreland, OK and Travis and Tracy Harris of Apache; grandchildren: Riley Roberts, Brayden DeForest, Breanna Harris, Garrett Harris, Sam Harris, Travis Harris, Jr, Tatum Harris, and Jordan Lindsey; great-grandchildren: Paisley Roberts, Karleigh Roberts, William Haven, Hadley Pahcoddy, Eric Pahcoddy and Adalee DeForest; brother, Ricky Dailey of Norman; and sister, Sheila Bybee of Apache. She is preceded in death by her father, Bill Dailey; and husband, Paul Harris.